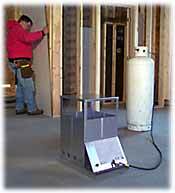 Portable propane heaters are designed for tough duty and perfect for temporary heating of warehouses, construction sites, garages, shop areas, machine sheds and more. These durable high capacity portable propane heaters require NO ELECTRICITY and are fueled by clean, efficient propane. • Safety Excess Flow P.O.L. Tank Fitting. • Piezo Ignition – allows safe, easy, push button ignition. No need for matches!